Concrete Padstones are stronger than masonry blocks and distribute weight efficiently, avoiding structural failure. We offer a range of precast padstones that are manufactured to a 40 N/mm2 compressive strength ensuring they are suitable for situations where a high-strength bearing pad is required. What is a precast concrete padstone? Padstones are the concrete blocks installed directly below a lintel or beam in a building construction. Denser than normal blocks – our precast padstones are manufactured to a 40 N/mm2 compressive strength – a padstone can take significant weight from above. This downwards force is then spread across any brick work below. Without the padstone, the blocks below would crack, causing expensive structural damage. Our padstones can be utilised in combination with pre-stressed concrete lintels or steel lintels. Why choose precast concrete padstones? Due to different conditions on-site, the casting process cannot be regulated. 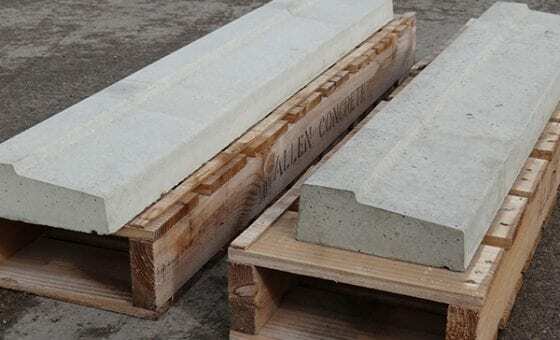 To ensure the padstones are consistent and conform to CE regulations, it is important to choose concrete padstones which have been cast in-situ. Choosing precast concrete also saves time on site, with no curing times to consider. Our padstones are available in a range of sizes, designed to fit most block and pier dimensions and may be used in any orientation.